A year ago, Can Kurban, Maria Haberer and I presented a communication at the conference IDP2016 â€“ Internet, Law and Politics. Building a European digital space, and it was published in its proceedings as What is technopolitics? A conceptual scheme for understanding politics in the digital age . Now, an improved version of that paper has been published at the IDP. Journal of Internet, Law and Politics, in its issue #24. In this article we seek to revisit what the term â€˜technopoliticalâ€™ means for democratic politics in our age. We begin by tracing how the term was used and then transformed through various and conflicting adaptations of ICTs (Information and Communication Technologies) in governmental and civil organizations and grassroots movements. Two main streams can be distinguished in academic literature: studies about internet-enhanced politics (labelled as e- government) and politics 2.0 that imply the facilitation of existing practices such as e-voting, e-campaigning and e-petitioning. The second stream of the internet-enabled perspective builds on the idea that ICTs are essential for the organization of transformative, contentious politics, citizen participation and deliberative processes. Under a range of labels, studies have often used ideas of the technopolitical in an undefined or underspecified manner for describing the influence of digital technologies on their scope of investigation. After critically reviewing and categorizing the main concepts used in the literature to describe ICT-based political performances, we construct a conceptual model of technopolitics oriented at two contra-rotating developments: Centralization vs. Decentralization. Within a schema consisting of the five dimensions of context, scale and direction, purpose, synchronization and actors we will clarify these developments and structure informal and formal ways of political practices. We explain the dimensions using real-world examples to illustrate the unique characteristics of each technopolitical action field and the power dynamics that influence them. Kurban, C., PeÃ±a-LÃ³pez, I. & Haberer, M. (2017). â€œWhat is technopolitics? A conceptual scheme for understanding politics in the digital ageâ€. In IDP. Revista de Internet, Derecho y Ciencia PolÃ­tica, 24. Barcelona: Universitat Oberta de Catalunya. Peña-López, I. (2017) “Article. What is technopolitics? 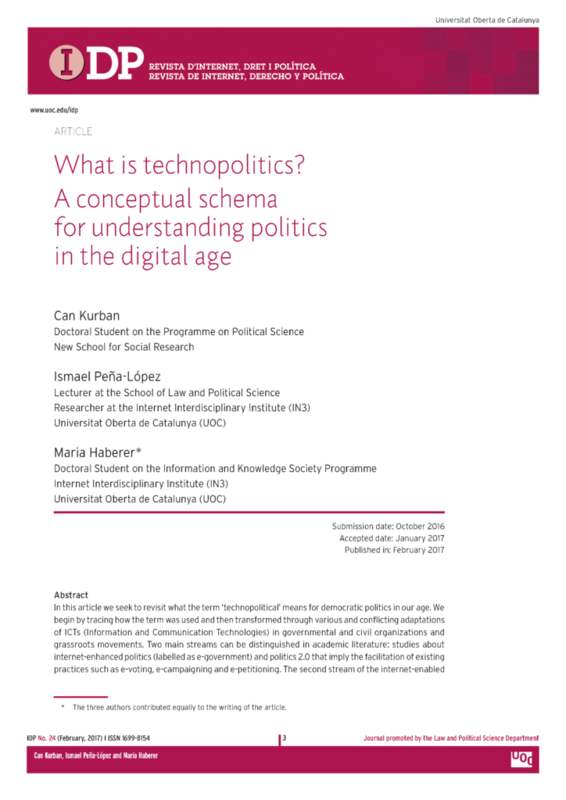 A conceptual scheme for understanding politics in the digital age” In ICTlogy, #164, May 2017. Barcelona: ICTlogy.